Chef Rodney Scruggs of the Occidental has been cooking in the DC area for more than 20 years — and he's ended up right where he started. At 18, he was hired as a line cook at Occidental and worked his way up to executive sous chef, under then-executive chef Jeff Buben (now of Vidalia and Bistro Bis fame). 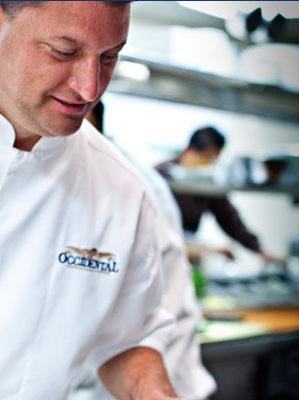 He followed his first Occidental run with stints at Galileo, Cesco and Bistro Bis and found himself back on familiar terrain when he was named head chef for the Occidental in 2005, just before the restaurant's 100th birthday. Here are his Five Bites. 1. Gina Chersevani's scalded milk cocktail at PS 7's "Tastes like a milk shake. Silky smooth."